Fluffy sugary things. You can't beat that. Or, rather, not only can you beat that, you must beat that, because that's how sugar gets so fluffy in the first place. 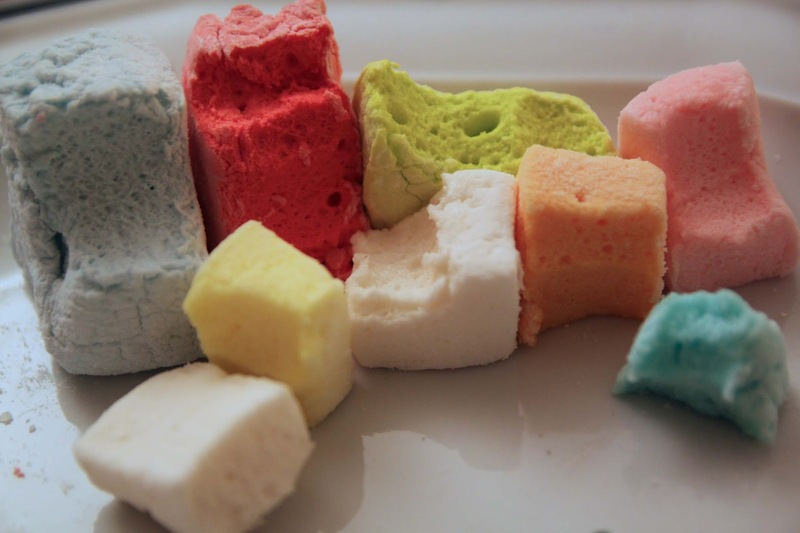 The French make their sugar go further, stretching it (sometimes literally) with egg whites and other ingredients to come up with three very French, very sweet treats: guimauves (like marshmallows), nougat, and meringue. Just so you know, I don't love any of them. For guimauves, the magic is with gelatin and egg whites. One of the reasons guimauves are not, technically, marshmallows (at least not real marshmallows) is that marshmallows get their sponginess not from gelatin (the French way) but with a marsh plant, called a mallow, whose root gives off a gelatinous thickener. For some reason, guimauves made at fairs take a different approach. A taffy-like approach. The pulling allows for ropier shapes that can be twisted up for served as "foot-long" ("meter-long"?!) and made into colorful, extravagant lollipop-like treats. That's fair food for you. To Americans, the festival version looks like a whole lot like pulled taffy, but it doesn't end up with that same caramel-like chew. You can certainly make guimauves at home -- and more authentic, old-fashioned ones -- without the mixing, aerating machines of the fair. Nougat, originally an Italian treat, seems to have made its way across the French border so long ago (sometime around the 16th or 17th centuries) that the French have claimed ownership. The first recipes for French nougat show up in the 18th century, in Montelimar, France. We get he word nougat from the Southern French Occitan dialect, meaning "nuts" or "nutty". Nougat owes its existence to the same two magic ingredients: egg whites and sugars. The difference in making nougat is that the beaten egg whites are mixed much longer and harder with more and stickier sweeteners. That gets you white nougat. Brown nougat (nougatine) has no egg whites and ends up crunchy, something like a nut brittle. Like guimauves, nougat comes in many flavors. Unlike guimauves, nougat is not all fluffiness and cloud: it has the crunch of nuts and occasionally dried fruit spread throughout. Also, the end result is much chewier than a guimauve, reminiscent of caramel sticking to the teeth. The most famous French version of egg whites and sugar: meringues. Here in France, you can buy flavored, colored meringues nearly as big as your head. I have never figured out how, exactly, you're supposed to eat one since it shatters the moment you bite or cut into it. But even if I'm not a huge meringue fan per se, one can't help but encounter, and even like, some meringue along the way in France, jazzed up in various desserts. One version of meringue (a more almondy, chewier version) is the base cookie for macarons. And they're all the base for Aux Merveilleux, which combines yet another way to eat sweet air: all the whipped cream that goes on top of the meringues. Of course, once it's already made, meringue is the one sweet treat you really can't beat, in the literal sense, because it's very delicate. Even trying to transport meringue, or meringue-based treats like macarons, is problematic, and you will almost certainly end up with crumbs. Kaïkou is an industrially made cheese from pasteurized sheeps' milk from the Pays Basque -- sheep country. The term Kaïkou comes from the local dialect word kaiku, which is a kind of wooden bucket used to catch milk. It's a pressed and cooked hard cheeses, aged five months or more. It's made with milk collected between December and July and aged at the Fromagerie Matocq, in Asson, near Bearn. The version I tastes is organic, though it seems there are also non-organic versions sold under the name Kaïkou and also, sometimes Kaïkou Matocq, or Kaïkou Pur Brebis Matocq. While some pasteurized cheeses lose too much flavor and funk, this cheese is a slightly sweet, nutty, hard cheese with character. It comes in a rock-solid, bowling-ball sized disc with a crust covered in brown, orange, and yellow mold. In fact, in 2015, it won the silver medal at the Concours General Agricole de 2015 (General Agricultural Contest 2015). Not only is Kaïkou a little sweet, like guimauves, nougat, and meringue, it also looks like a big slab o' nougat. Or, perhaps, it's the nougat that looks like cheese. Either way, I find my Kaïkou at a street fair and originally confuse it with the nougat being sold in the neighboring stall. The two almost blend right into each other by looks. But not by taste.